Amérique Septentrionale an XI 1803 - MALISSET, Jean Baptiste Antoine. Title : Amérique Septentrionale an XI 1803. Map maker : MALISSET, Jean Baptiste Antoine.. Size : 7.3 x 8.4 inches. / 18.5 x 21.3 cm. 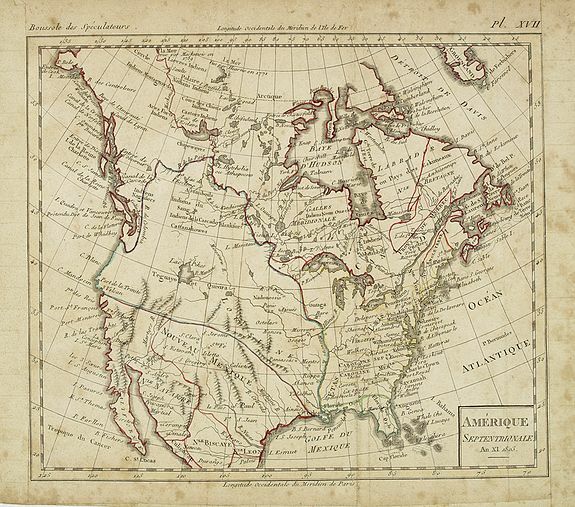 Description :Curious map of North America taken from "Boussole des speculateurs". An uncommon encyclopedical work which should according to the title usefull for investors and business men. With some curious border lines. Condition : Mounted on paper, with staining throughout.